You’re always looking out for others. Always pinching pennies. Always ready to lend a hand for a good cause or a person in need. It’s about time you did something for yourself. 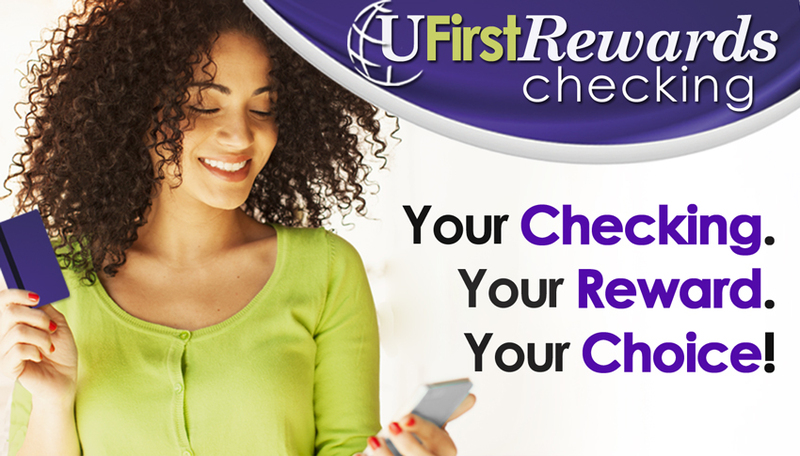 It’s time to reward yourself with “UFirst Reward Checking” from United Financial. Not all checking accounts are the same. Some work harder for you than others. So do yourself a favor and sign up for reward checking. If you already have a rewards credit card, you understand the concept. Now take your checking account to the next level! You already know the benefits of checking with United Financial. You don’t have to worry about maintaining a high minimum balance. You don’t have to worry about how many checks a month you write. Online access is always free. You even get identity theft protection! These days, that might feel like reward enough. However, we want to offer additional rewards for our customers. How do these reward options for your checking account sound? You get to choose what Reward YOU want! Above market rate on your monthly average daily balance (up to $10,000) in your reward checking account. Why should you only receive a good rate on your savings accounts? Your balance in your checking account should count for something, too! Cash Back Rewards Checking can provide you 1% cash back on your Debit Card purchases (up to $10 a month). You use your debit card all the time – now get rewarded for it! iRewards Checking will reimburse you for purchases made from the iTunes or Google Play Store (up to $10 a month). Say YES to more music and games!! Are you annoyed by ATM withdrawal surcharges? We are, too. That’s why we’ll reimburse you when you meet certain qualifications on any of the above reward levels! Can you jump through these hoops? Every reward checking program has its requirements, but some programs are so complicated they’re hardly worth the effort. At United Financial, we like to keep rewards simple. Our hoops aren’t too high to jump through, and we certainly don’t set them on fire! A UFirst Reward Checking Account. You need to sign up for a reward account. Talk to us or sign up online. It’s pretty straightforward. You won’t need an attorney to explain the fine print before you sign on. Direct Deposit. You probably already set up direct deposit on day one of your job. Your employer likely required it. Besides, you didn’t need the hassle of making a trip to the credit union to deposit your paycheck every other week. Are you kidding? Virtual Branch. How often do you log onto your account each month? At least once? Then you have this qualification met! That was easy, wasn’t it? This hoop won’t burn you! E-Statements. You already receive e-statements. You’d rather save trees and not have to bother shredding your statements after you’ve checked them. You can check this hoop off your list! Fifteen Debit Card transactions that are greater than $5.00. If your attitude is “Cash? Who needs cash?” because everything goes on your debit card, you could meet this requirement without even thinking about it. All you have to do is what you already do. Pay one bill a month with Net Pay Online Bill Pay. How many bills a month do you pay? How easy would it be to pay just one of them online? Chances are, you routinely pay more than one a month online already. If you’ve already checked all these boxes, what are you waiting for? Sign up for your reward checking! It’s as simple as one, two, three! Sign up for a Reward Checking Account. Receive your Reward at the end of the month! If for some reason, you don’t meet the monthly requirements, you won’t receive a reward at the end of that month. Not to worry! You are still enrolled, so simply meet the requirements the following month and enjoy your reward! You do need to know that there are a few restrictions. The reward checking account is for personal accounts only, not for business accounts. And only one reward checking account is permitted per member (SSN). Stop into United Financial and learn more about reward options for your checking account. We’ll help you sign up so you can start earning rewards today. In one month you’ll understand why it’s called “U First” Reward Checking! You always come first with United Financial!